Well, it's keeping the body for an all-electric version, but the V12 will soon be dead and gone. Porsche hit the stage at the most recent Geneva Motor Show and brought with it a new high powered Panamera along with a wagon version of the four-door. Then Mercedes brought a four-door concept that confirmed rumors speculating a sedan version Mercedes-AMG GT was coming to take on the Panamera. With this most recent volley of four door sports cars, it could lead anyone to think that the segment is poised for growth. However, Motoring begs to differ with its latest report on Aston Martin. 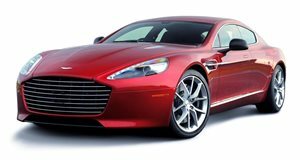 Speaking with Aston Martin CEO Andy Palmer, the Australian auto site heard that the four-door Rapide will be getting the axe. Well, at least its fossil fuel-powered versions will. Instead of a signature V12 engine under the hood emitting a glorious exhaust note, an electric drivetrain will take its place. Dubbed the RapidE, this new four-door Aston Martin will come in 2018 and stand as a symbol of what’s to come from the automaker as it strives to lower its emissions and follow the rest of the industry to electrification. “So obviously there’s a platform for the electric Rapide, so it has life in front of it, but the Rapide as you see it today is also going to be replaced by the DBX on one hand and the Lagonda on the other,” said Palmer. By making this move, it appears that Palmer and his company will be expanding the lineup to satisfy more customers. The DBX will offer an alternative to the new class of attractive and luxurious SUVs that have been coming from Bentley, Maserati, Alfa Romeo, and soon, Lamborghini. As for the Lagonda, we previously heard that Aston Martin would be reviving the badge as a sort of ultra luxury marquee that could compete with Bentley and Rolls-Royce super sedans. In our minds this leaves one massive gap in the segment, namely, the four-door sports car that the Rapide once was, the only car in Aston Martin’s lineup that could compete with the Porsche Panamera and Mercedes-AMG GT 4. Two pieces of hope we can cling to are the RapidE’s performance, which could top out around 800 horsepower, as well as the fact that Palmer made sure to mention that the name Rapide was originally a Lagonda nameplate, implying that one of the upcoming Lagonda-badged models could be the four-door sports car we so crave. Those wanting a final taste of the gorgeous sedan can snap up the Rapide AMR in order to help Aston Martin give one of the prettiest and most functional cars a proper sendoff.